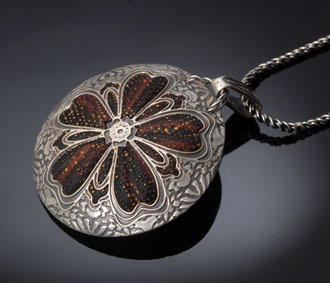 'Sea Flower' began as a personal challenge to create a piece where the fine silver and polymer clay truly interact with each other. 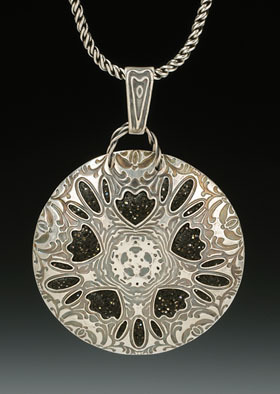 The finished pendant has a sea-urchin-like appeal. 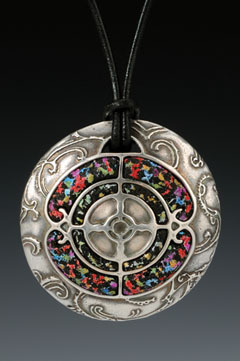 The colors within the four Celtic circles interplay with each other against their silver canvas. 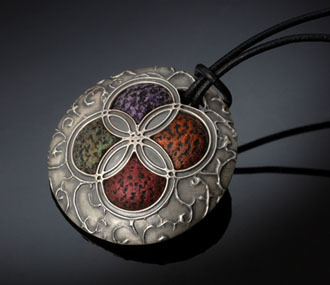 Pendant is hand-created using fine silver, polymer, and pigments. An 18" leather cord w/sterling clasp and extender is included. 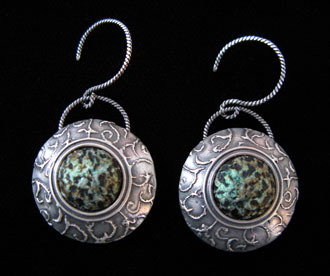 'Circles Earrings' can be worn by themselves or to match the Circles Pendant. Request green (shown), red, orange, or purple. 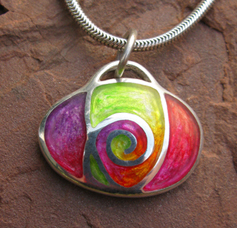 Colors choices can be seen in the Circles Pendant above. 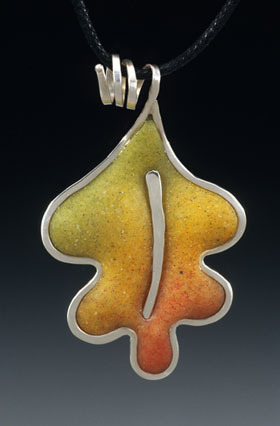 Fine silver, polymer, and pigments. 'Mozart' is perfect for a night out on the town and goes with most everything. 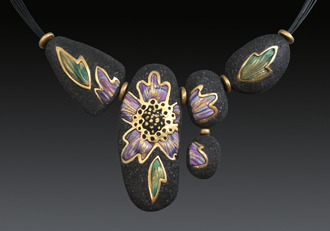 It's not apparent in the photo, but the black areas enjoy a druzy-like sparkle in the light. The polymer in 'Promenade' reminds me of a wool tweed jacket I used to have. It looks as though someone is wearing it as they stroll by an old iron gate. Recently had the pleasure of taking a workshop with Cynthia Toops at the Philadelphia PC Guild. 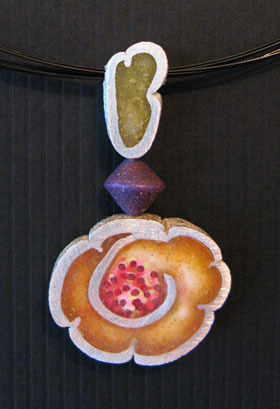 Her micro-mosaic threads are so small, that a finished piece looks like tapestry to me. This is my finished class piece. Scribbles uses a technique I call Enamel Illusions. 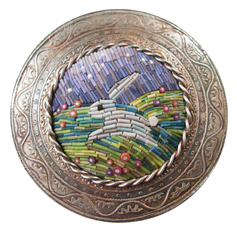 The finished piece closely mimics vitreous enamel. More examples can be found on the workshop page.